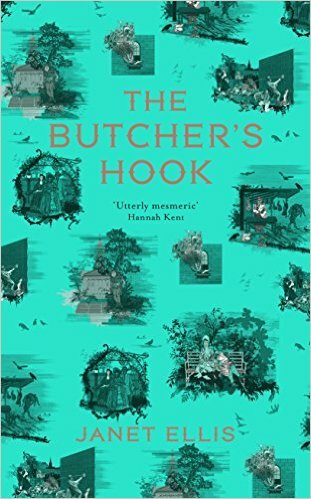 The Butcher's Hook tells the story of 19 year old Anne Jaccobs, the eldest and until recently only daughter in a wealthy Georgian family. Having recently lost a beloved infant brother to fever, Anne is an odd, solitary young woman, morbid and content with her own company. Her ailing mother is confined with a new, sickly baby (a sister that Anne finds it so desperately hard to care about) and her callous, pompous father is at the stage where he is so wearied and inconvenienced by Anne's existence, he's willing to marry her off to creepy old men in a pretty mercenary fashion. Anne shares with the reader certain secrets that explain her aversion to older men...could these secrets also explain Anne's later-in-the-novel actions?Unwilling to be sold off quietly, Anne strikes up an acquaintance which quickly becomes a passionate affair with Fub, the butcher's dark eyed apprentice. Consumed with desire for Fub, Anne will go to surprising lengths to satisfy her addiction to her boy. He becomes her world, her whole reason for existing. To begin with he seems quite sweet, a rough but delicious type that dotes on Anne and their snatched hours together...she seems naïve and quite reckless, but for once she is happy. Her world experiences something of a seismic shift. She loses all sense of reality and prospective, losing herself in her passionate fantasies of Fub and their breathless, clandestine meetings. The first half of the story is a fairly recognisable tale of a young woman being steered into a horrendous marriage to a genuinely creepy character, one that seems to openly gloat in his ensnaring of her against her will. Love or social position: so far, so familiar. What sets The Butcher's Hook apart from more regular domestic tales of marriage and misery in the 18th century is the unexpected trajectory of Anne's character. Throughout the second half of the story both central characters undergo some surprising and very skilfully managed transformations that leave the reader's head spinning. I really couldn't tell where the narrative was heading. The evolution of the characters was one of the elements of the novel that I was most impressed with- how the reader's perceptions of Anne and Fub change. I couldn't be sure if Fub's character actually become more duplicitous, whether his more unsavoury character traits overtook his charm, or whether Anne's changing feelings towards him affects our view of him too; either way, it was subtly and expertly achieved. I loved how infatuation and obsession is depicted as something that be one minute thoroughly enthralling, then can disappear without warning like a candle being pinched. I really felt like I saw the world through Anne's nihilistic eyes; she's a dark, damaged and unforgettable young woman. Ellis does a remarkable job of building our sympathy for the character; unguided, alone, apparently unloved. She's invisible within her family and objectified, abused and confused by those she trusts. We see her fight against her familial and social obligations for a chance to make her own decisions. Ellis carries the reader along on Anne's errands, her lover's escapades and schemes and on her later deeds. Anne's narration is precise and unflinching, what she is doing seems to make so much sense, seems so obviously simple to her, that it almost rubs off on the reader. I kept catching myself almost agreeing with her logic, which was quite disturbing. I was completely absorbed into Anne's mindset. I was incredibly impressed with Ellis' prose- beautiful in places and shocking in others, she displays a real grasp of language and knows the shocking power of a well-placed, incongruous simile or a wicked thought. A couple of times I had to re-read a line just to check I'd seen the right thing...her intricate and complicated characters are spellbinding and she has the readers eating out of her hand-the way that the our opinions and perceptions are played with and bent into and out of shape is brilliant. I loved how the novel was able to surprise me and kept me guessing not only about the plot but about the characters. Though I'd describe the novel as sensational and slightly unlikely, it was an enjoyable, twisted journey nonetheless, a gripping whirlwind of passion, debauchery and moral vacancy which I'd thoroughly recommend.